The Mahlke Chronicles: 3-2-1 Blast off! Before I get into our week, I'd first like to do a quick update on Ashton's doctor appointment... Wednesday afternoon we dropped Spencer off at a friend's house, and we made the trek with Ashton to Mayo Clinic to see a specialist for pectus excavatum. Although we didn't learn much more than what we already knew going into the appointment, it was nice getting all the information from someone more knowledgeable than our family doctor. The specialist explained that the cartilage between Ashton's rib bones are growing abnormally, which causes the chest wall to cave in. He examined Ashton to confirm the diagnosis, and then told us it is a Wait-and-See game. We will have to wait and see how he grows and if things get progressively worse. He doesn't need to be seen again until 6-8 years of age, and then they would just monitor his growth and the progression of the pectus excavatum. They wouldn't treat it until he is 12-14 years old, unless it's serious, as to wait out all the major growth spurts. The current treatment is surgery to insert a metal rod in the chest to push it outward. Who knows what the treatment will be in 10 or so years, though. So for now...we wait. Even Mater is all dressed up and ready to explore outer space with us. This was week one of our space exploration. Spencer has taken an interest in the solar system, all thanks to a Mickey Mouse episode where the gang goes into outer space. I decided I'd capitalize on this and brainstormed a bunch of solar system project and activity ideas. Week one learning about the planets went really well. I compiled a handful of interesting facts on each planet and made a simple book on my home printer. We now know that Jupiter is the largest planet, Venus the hottest, Neptune has rings like Saturn even though you can't see them as easily, and Pluto isn't really a planet. I demonstrated how the planets circle around the sun, using balls as visual aids, and how each planet spins on its axis. I explained that when the earth is facing the sun, it's called daytime and when it's away from the sun, it's nighttime. Not only did we make a trip to the library to check-out books, but we also did projects and activities geared around the solar system. The first one was a Match the Planets Puzzle. I made a poster of the planets. The puzzle pieces were made from recycled cereal boxes for durability. Spencer had fun matching the individual planet pieces onto the poster. His favorite planet is Pluto (probably because of Mickey's dog), even when I explain it's no longer a real planet, but a pretend one instead. Dave made a rocket ship out of a cereal box one night for Spencer to play with, but that was quickly tossed aside when we made one out of an old car seat box. First I cut off the top flaps on the box and made a door and a hole for a window and a circle for a steering wheel, and then the boys colored the box with markers. This box converted space ship entertained my boys for days, long after it was destroyed and no longer standing upright. It has since been pushed aside and claimed by the fat cat as a nice napping place. Blasting off into outer space. Admiring the view out of the window. Decorating the inside of the space ship later. Hopefully they have a back-up plan to get back to earth since their space ship broke down on Mars. We also discussed the night sky this week. We made a picture of the night sky by first making a bunch of dots with a yellow crayon on a black piece of construction paper. Then Spencer glued on a moon and some stars. Finally he completed the picture by shaking a bunch of gold glitter over the whole thing. That night Spencer and I bundled up under some blankets on the deck to do some stargazing. We had to bring a flashlight because Spenc has suddenly developed a fear of the dark. We snacked on some Halloween candy and peered up at the stars, trying to locate the big dipper we learned about in a library book. This only lasted about 10 minutes before Spencer decided he wanted to go inside, fear of the dark having won over the excitement of learning. Passed out after a busy day at school. Also this week Ashton and I started our ECFE (Early Childhood Family Education) class, Bearly Toddlers. This is a class Spencer and I did together when he was one, and I really wanted to do it with Ashton as well. Since I am a stay at home mom and do not have a daycare provider, I first had to find childcare for Spencer. Luckily one of Spencer's all-time favorite people in the world agreed to watch him every Friday morning. So while Ash and I were at school, Spencer was driving around in the woods on tractors with Marmer. We hadn't attended an ECFE class since last spring and I was definitely going through withdrawals. I knew I missed the community and the classes, but I didn't realize how much I really needed it until Friday. As a stay at home mom I don't have much access to the world outside of my two young children, so anything that involves other adults and social interaction is very vital to my health! It was fun watching Ashton in the class. I noticed so many differences between him and his brother. Spencer was very shy and reserved during his first few months at these classes, staying very close to me. Ashton barely noticed I was there; he was off exploring everything the classroom had to offer and making new friends. This weekend we lined up a sitter for the boys, and Dave and I celebrated our friend Ann's birthday. It was a much needed night out with adults. Before adding the random pictures from the week, I'd like to say a big THANK YOU to all the veterans on this important day honoring all who have served our country. A special huge thanks to my husband, who fought and was injured during the first part of the Operation Iraqi Freedom war. We love you, David! Enjoying the warmer weather with a good ol' tractor ride. Spenc modeling some bobby pins. Driving an ambulance at Flippin' For Books. Being goofy with his best bud, Jackson. Enjoying the first snow fall. 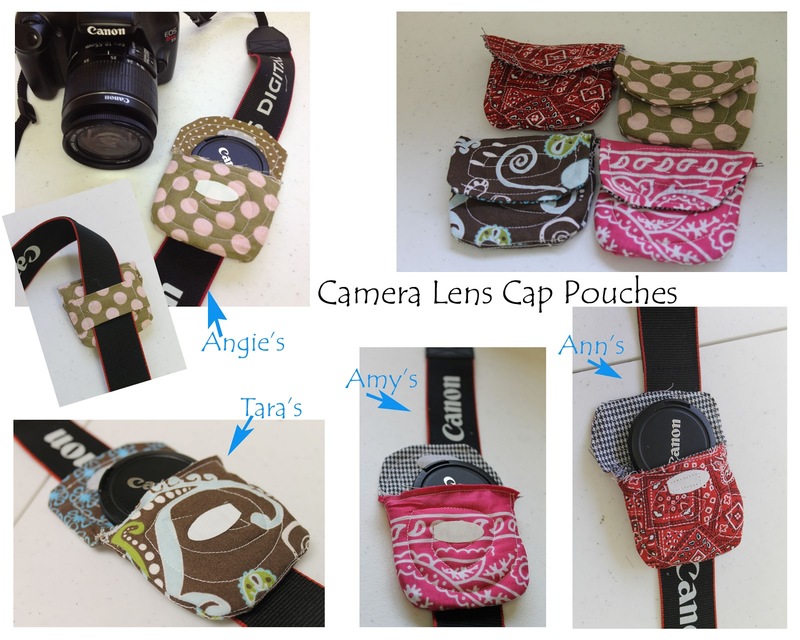 I found this idea on Pinterest to make a pouch for my camera lens, which is genius since I'm always forgetting where I put mine. I also made one for my friend for her birthday, one for my photographer friend, and one for my mother-in-law. Modeling the infinity scarf I made Ann for her birthday.